Salvaging leftovers – while not the most romantic or esoteric of cooking practices – is the departure point for the better part of the cooking I do. I suspect the same applies to you. We might not always be thrilled about cooking what’s hanging out in there, especially after a hectic day, but there is a kind of satisfaction that comes from pulling together random (and sometimes less-than-pretty) ingredients and turning them into a legitimate meal. A leftover chicken carcass; floppy celery tops; speckled bananas; a pint of yogurt hovering near the expiry date – to the salvager, these are all opportunities in disguise. For the most part I learnt how to cook with odds and ends by watching my maternal grandparents plug away in the kitchen. (You may have already met them here. Or here. Or even here.) They left their tiny, tight-knit village in the Apennines in the 1950s, but prior to that, they’d endured their fair share of hardships (the Spanish flu, Second World War rationing, pilferage by foreign soldiers…), which meant that they’d learnt how to make do with very little. By the time they came to Canada, they’d become experts of cucina povera. It flowed through their veins. They could pull together meals from seemingly nothing, with an effortlesness that came from years of self-sufficiency. It was a waste-not-want-not approach, as dishes like pasta e fagioli, rapini aglio olio, ribolatta, and polenta were all inexpensive ways of using up pantry items, scraps and leftovers. The term “poor man’s cooking” might come across as pejorative, but cucina povera – while born of economic necessity – is actually a treasure trove of traditions and regional customs, passed down from one generation to the next. Also, cooking with less doesn’t necessarily mean going without. Nonna often reminds me that – even in the leanest times – they always ate well, by which she means that her family not always had food on the table, but always had good food on the table. A bit of olive oil, some sliced garlic, chili flakes and spaghetti were all that was needed to make a slippery plate of pasta aglio olio; a potato, some leftover cabbage, polenta and a chunk of pancetta made a flavourful bowl of cazzarielli soup; leftover beans, fried up with thin slices of onion and swiss chard, served on a thick piece of toasted bread, and topped with a ladleful of broth made a satisfying lunch. And since all it took was a little water or an extra onion to stretch out a meal, it could feed as many hungry mouths as it needed to, with the leftovers reworked and reinvented the next day to make something altogether new. It’s a testament to how any ingredient – no matter how modest – can be transformed into something delicious and sustaining; it’s also one of truer expressions of Italian arrangiarsi (the art of making something out of nothing) which I think is the ace up the sleeve of many Italian grandparents. Bread – and especially stale, leftover bread – is an important staple in cucina povera, in part because it can be easily reworked. The Tuscans make a type of soup with day-old bread, ripe tomatoes, garlic and basil called pappa al pomodoro, to be eaten preferably (but not exclusively) in the shade on a blistering summer’s day. There’s also pan grattato, rustic breadcrumbs made from stale bread, then toasted in oil, herbs, and seasonings (anchovies, lemon zest) and sprinkled over pasta as a replacement for its more expensive counterparts, Parmigiano and pecorino. 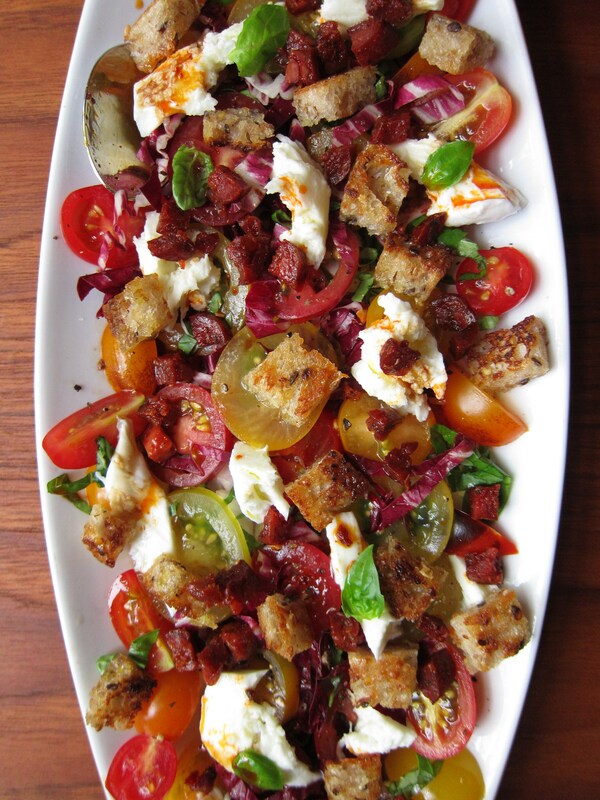 Panzanella is another way that Italians use up stale bread. It’s essentially a bread salad made with ripe tomatoes, some cucumber, onion, olive oil, a dash of vinegar and a bit of basil. Some will tell you to toast the bread beforehand; some will have you soak the bread in a bit of water to revive it. Others might have mush up the bread and the tomato into a pappa, or pulp, before combining with the other ingredients. But most recipes, regardless of the toast or no toast principle, insist that you mix the pieces of bread with the tomato wedges and allow it all to rest at room temperature for about an hour before serving, so that the juices from the tomato can be absorbed into the bread. 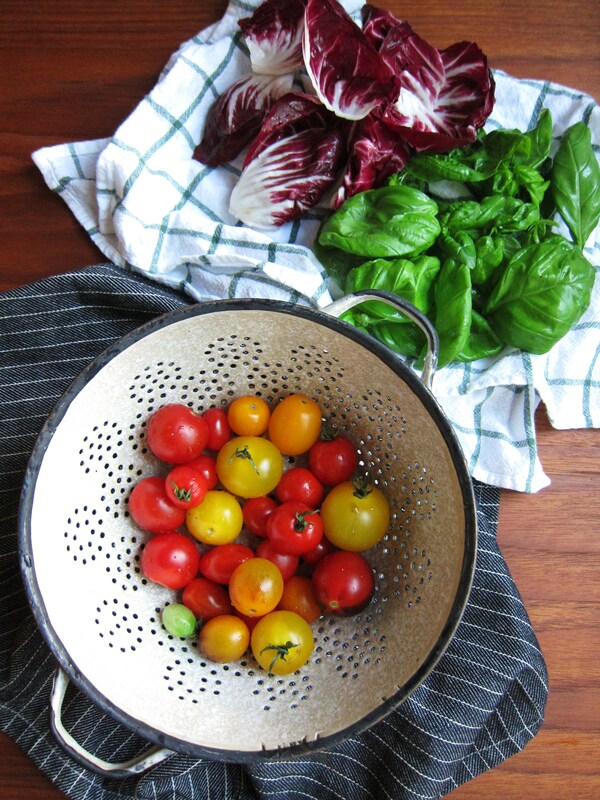 This is the one secret behind panzanella: the slow soak. It’s important that the ingredients have time to mellow out together, allowing that ripe, summery tomato flavour to seep into the bread’s crumb and soften it. 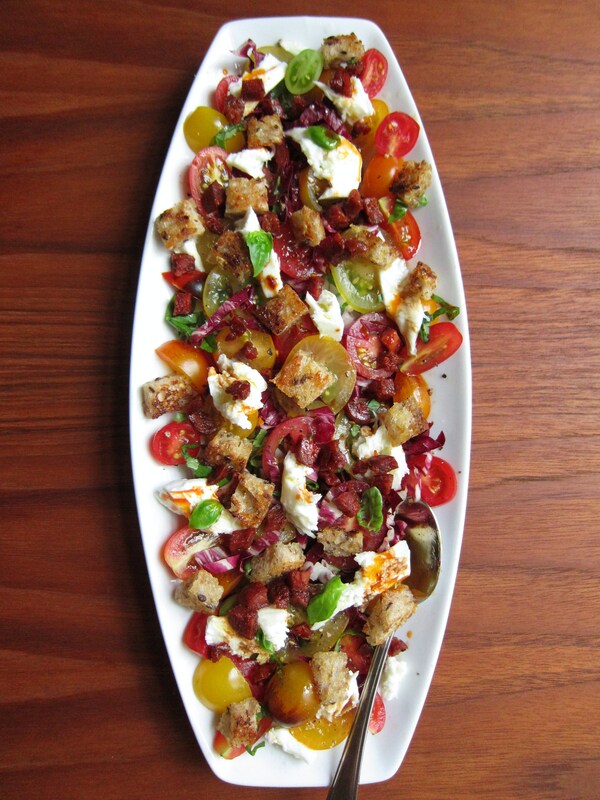 Now, before you scroll down any further, know this: the recipe below is not panzanella autentica, but it’s something of a close cousin. 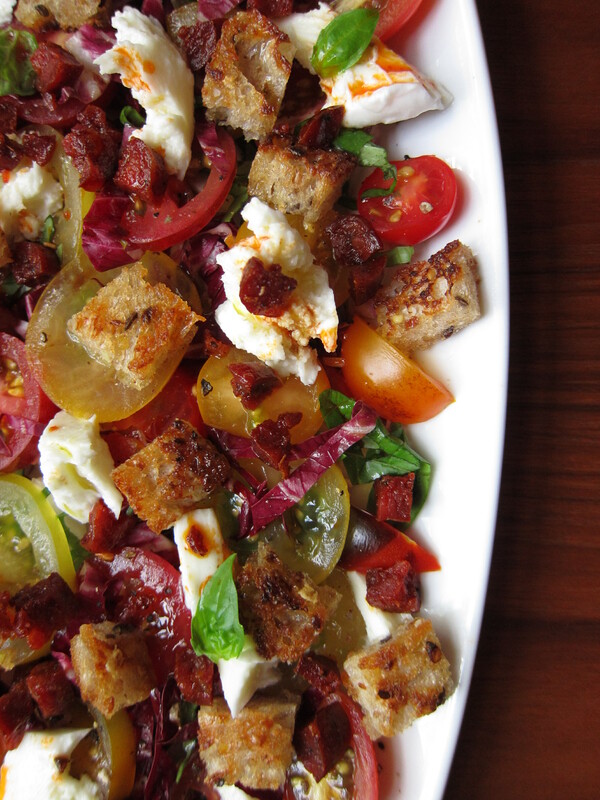 Which is why we’re going to call it “panzanella-style” salad. You’ll see that there are a few non-traditional flourishes, including shredded raddichio, some fried chorizo and fresh mozzarella (these last two not being very cucina povera, I might add). But, at the very least, this salad was made in the spirit of “waste not want not”: I had a half-loaf of stale bread, a bunch of fresh basil that needed some freshening up, a nub of chorizo hanging out at the back of the fridge, and a pint of cherry tomatoes ripening on the windowsill. The result proves that scouring the fridge can bear rich rewards. *Montreal: there are now producers that make buffalo mozzarella in Quebec; ask your local cheesemonger about it. 1) Set a pan on medium-high heat; add a glug of olive oil. Once it’s hot (but not smoking), add the cubed bread and toast until golden. Remove from pan and set aside. 2) With the leftover oil in the pan, lightly fry the garlic (about 20 seconds), then return the bread to the man and mix to combine. Transfer the bread and garlic into a large bowl. Add the halved (or quartered) tomatoes, sliced basil, diced shallot and toss to combine. Drizzle some olive oil over the top and add a small splash of red wine vinegar. Season with salt and pepper, give it a final toss and set aside at room temperature for 30 minutes to an hour. 3) Put the pan from before back on medium-high heat. Once hot, add the diced chorizo and fry until slightly crispy (about 3 minutes). 4) Add the sliced raddichio to the bread mixture and mix to combine. Place the mixture on a serving platter. Shread the mozzarella over top, then sprinkle the salad with the fried chorizo and some of its rendered fat. Serve immediately.